On a remote island, Constable Harris (Sam Kydd) makes a horrifying discovery, a local farmer is found dead, his corpse is boneless. A local physician, Dr. Landers (Eddie Byrne) doesn’t know what to make of it and ends up recruiting Dr. Stanley (Peter Cushing) and Dr. West (Edward Judd) from a London University to the case. Soon they discover that a cancer research lab on the island has suffered a terrible accident and has unleashed a dangerous new lifeform, The Silicates. A great monster is a kind that horrifies by its very existence. 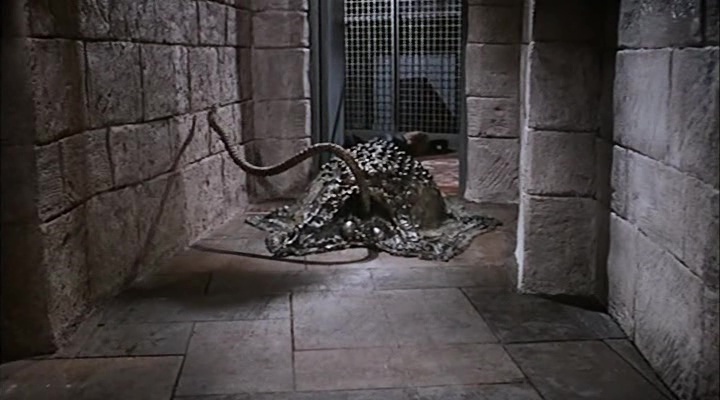 I won’t say that the killer giant cells of Island of Terror are the most dramatic screen creatures ever filmed, they just kind of sit there and waggle their tentacles most of the time, but what they do and how they feed is supremely horrific. The idea of the creatures is great even if the execution isn’t wholly successful. Thankfully, director, Terrance Fisher is no slouch when it comes to using monsters effectively, and manages to turn these potentially laughable creatures into something menacing. Peter Cushing plays Dr. Brian Stanley, and although not promoted as the lead of the film he easily steals every scene he’s in. Cushing attacks the material with the gravitas he is known for but he also manages to inject quite a bit of humor in his role. This both gives the outlandish story some reality and then takes just a little bit of the edge off of a grim situation. Dr. Stanley is the kind of person who laughs off his own dismemberment. Edward Judd as Dr. David West is fine, but his character is saddled with the romantic sub-plot and it drags his character down. Carol Gray’s performance as Toni Merill is very charming, but it is unfortunate that she is initially introduced as very forward and adventurous only to have her reduced to being a screaming target for most of the film. 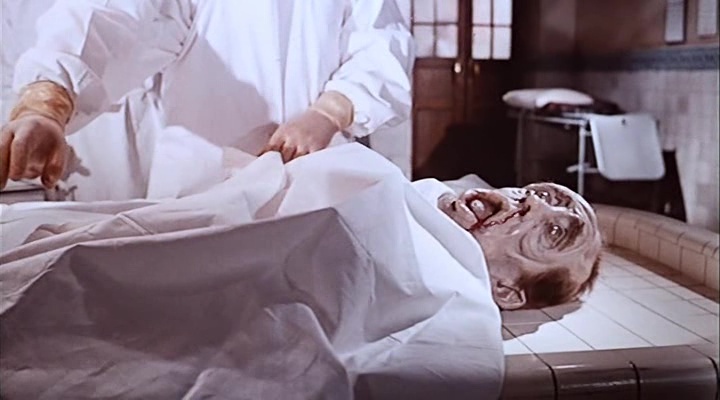 The uncut version of Island of Terror features a fair amount of gore, limbs are chopped off, bodies are cut open in the morgue, and we are also treated to a fair number of floppy boneless corpses. The Silicates are mostly inert blobs, but they still manage to be disgusting with their gooey cellular mitosis and loud continuous slurping when they feed on bones. There is also a healthy amount of suspense as we build towards the characters’ first encounter with a monster. These moments work the best as our heroes face the unknown and the possibilities are infinite. One final note is that the solution to defeating the monsters has an unexpectedly cruel edge to it. 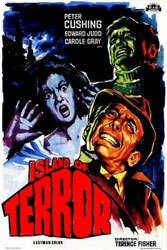 Island of Terror is a serviceable enough horror film. The giant cells and their rubbery victims could have turned this movie into another b-movie goof, but Cushing and Fisher do their all to hold it all together. 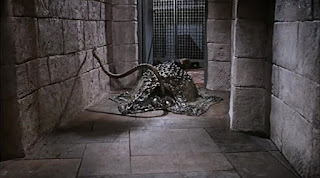 With this being a 1960s UK production, it features just a little more gore, sexual innuendo, and thought behind its monsters then a comparable US production of the time. Island of Terror doesn’t revolutionize SF-Horror but it manages to entertain.